The Archer Cup is scheduled to take place September 30 - Oct 1st. It was originally slated to be a $10,000 added based on a 32 player field, this was guaranteed. However there has been a big backlash from Québec pro's and semi pros about the entry fee being $400 after fee's for Pro and $280 for Semi-Pros. Now look at the poster above the BREAK EVEN line is top 16 and top 12 is profit. This is as good or better payout then Turning Stone because it is only $10,000 added compared to $25,000 and the Archer Cup is only a two day event compared to 4 for Turning Stone. For many Québec players the expenses is not even close to the same and this event is in their back yard. Even players from Québec City are only a few hours away. Now think of the U.S Open, it is $1000 entry American. You need to book a hotel for 7 days minimum. The profit line is top 5, and you have to beat out 191 of the best players in the world. Québec is a talent packed province and despite how some of them talk it is clear they have aspirations like all pool players to be better and play well against the best in the world. Marco Sanschargrin is giving Québec players this opportunity to go at some of the best in the world and made if affordable, if you think about it logically. He is seeding the tournament so based on the field in the poster above most players semi-pro and above are guaranteed to get through the group stage and have a fair chance of breaking even. Not to mention top semi-pro will receive $400 and top AAA $300. Most Pro's if they don't have the money get staked its as simple as that. Traveling Pro's understand that "backers" are a normal part of the game, and that in the long run they can make them a profit or break even. Also these guys are gamblers a big part of it for them is to have a horse in the field they can sweat and see if they make money, this is all common. I believe that the problem is most Québec Pro's do not travel much and they don't look at tournaments like this the way "road" players do. You could not ask for a better 2 day pro event and to think even in a 64 player field, maybe it will attract 5 world class players. This means you can talk to your backer and say that you have a good chance to break even and a cheap shot at $5000. Unfortunately for the most part I am hearing "its too much I cant win." So now Sanschagrin who has done so much for professional pool in Québec is left scratching his head. Because last minute the players wont support him. It is outrageous really and I have recently spoken to him, he is at a loss for words. The reality is now players have frustrated one of the best promoters in Canada into thinking he does not want anything to do with Professional events anymore. The Archer Cup could be the last Pro event Sanschagrin and Eventime Production promote. To be honest I cannot blame him the truth his the Québec pro's and semi-pros complain too much and don't show up when he needs them, a perfect example is the Canadian Championships his past year. It was well attended but their could have been dozens more French Canadians in the field. Now we are in a situation that Marco has to drastically lower the entry fee so he can fill this field. This means that it will no longer be $10,000 added because international players will not come and he got this sponsorship by promising an international field. 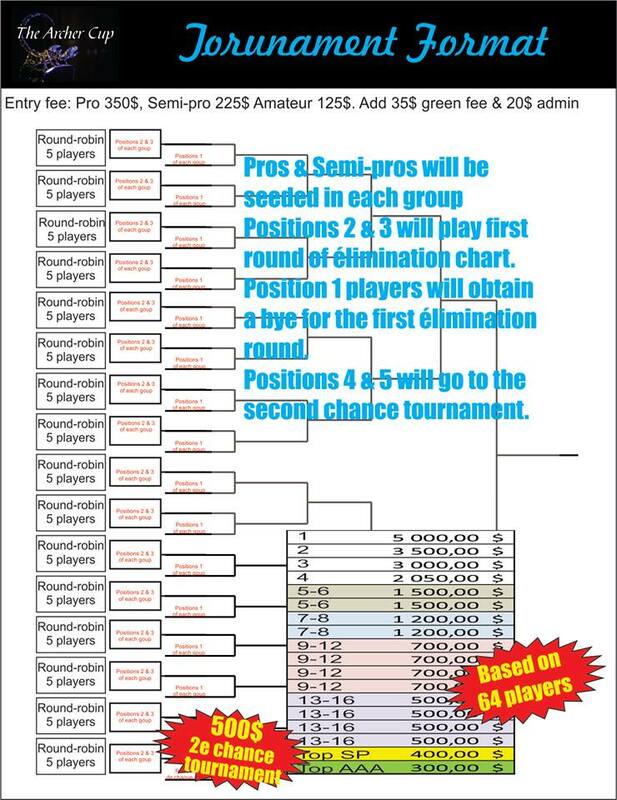 In conclusion if you look at this reasonably the entry fee is not a problem for semi-pro players and above. Sanschagrin is almost gift wrapping the break even envelope for these caliber players. This article is a last minute plea to save this event and keep the entries where its at. For I fear if Sanschagrin lowers the entries just to fill the field, Québec Professional players will have lost one of their biggest supporters permanently. These events should be praised and welcomed with open arms, I know the players that can afford it will do the right thing. 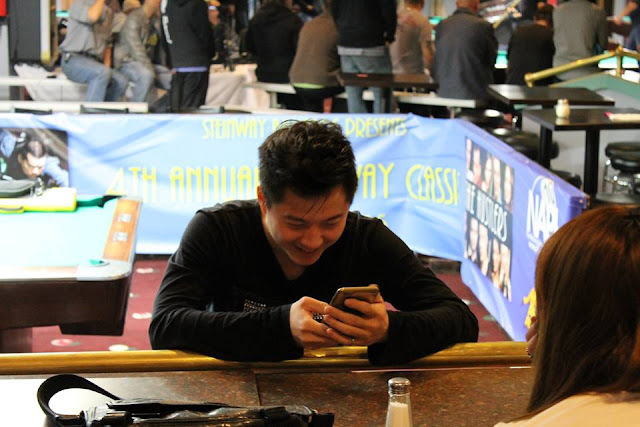 "Make Pool Great Again"
This past weekend the World 14.1 Straight Pool Tournament took place at Steinway Billiards in Queens, New York. The worlds best straight pool players including Darren Appleton, Thorsten Hohmann, Shane Van Boening and John Schmidt were all on hand. In the end it would be Mika Immonen taking home the $10 000 first prize defeating Earl Strickland in the final. Strickland's road to the final however took a tumultuous turn in the his semi final match against up and coming superstar Jayson Shaw. What unfolded with the score being 189 to 184 in favor of Strickland was one of the oddest circumstances I have ever seen in pool let alone a professional match. Although the audio and video is not HD quality you can see that Earl clearly calls the 2 ball in the corner pocket by accident instead of the ten ball which he intended to pocket. Obviously earl was caught in the heat of the moment and recognized the ten as the same color as the 2 and dismissed the stripe part of the ball. The standing rule in straight pool is that you must call shots that are not obvious and you must call the number of the ball correctly. In fact in another odd occurrence, although not on video, Strickland had been called on a foul for making this exact mistake earlier in the match. Definitely an odd beginning to the discrepancy but what happened from there was even more obscure. Here is the second video from the stream. This shot was under review until 11 minute 30 second mark. The tournament director comes over and makes his ruling. After watching this video you can see the issue that further confounds the situation is that the tournament director was not present at the time of the shot, however apparently he did have a referee watching the match. As you can see in the video the tournament director decides to review the shot on the stream and says Earl's call was inaudible because the commentators were speaking as Earl was calling the ball. The video in this article and the video circulating on Facebook is a cell phone video and in this video it is clear that Earl calls the wrong ball. After the tournament director determined the call was inaudible on the stream I do not expect him to have the presence of mind to see if there were any other live videos but it is my understanding that the gentleman in the dress shirt seated near Shaw was observing the match in a refereeing capacity. Why the tournament director did not ask the secondary referee who was sitting right there for input is beyond me and I feel its really unfortunate he didn't because in the end by the rule book the wrong ruling was made. A lot of people are begrudging Earl for what happened but it has to be said that it was obvious that he pocketed the ball he intended he just made an honest mistake with the number of the ball. Shaw is known tour wide as a very sportsmanlike player and is one of the most exciting players in the game but the question must be asked "did he really want to win that way?". I believe prior run ins with Earl made it easy for him to pounce on the opportunity to take advantage of the situation. I also believe that the same occurrence being called a foul earlier in the match prompted Shaw to see the same call be made again. I would like to make it clear that I am not saying by any means Shaw was out of line here and the final ruling was very unfortunate for him and I think he is a great role model and ambassador for the game. I do wonder though what would have happened if Earl immediately admitted he made an honest mistake and looked him in the eye and asked him if he really wanted to win like that. Again though that is not what did happen and I believe prior history and like I said the same foul being called in the match already I would not fault him in any way for standing up in what he believed in. Shaw's decision to call Strickland on his actions falls into the "gentleman rule" exceptions, here are a couple of instances where I feel a player is abusing the gentleman rule. 1. when your opponent fouls you must by the book, verbally ask "ball in hand?" your opponent must acknowledge, technically picking up the cue ball without asking is a foul. Worst infraction, the fouling player should never invoke this rule. 2. the cue ball must come to a complete stop after pocketing the last ball after before it is moved......as long as the cue ball isn't tracking near a pocket this rule should never be challenged by the incoming player. 4. Playing rotation the player allows the other player to shoot a ball out of sequence, nothing ungentlemanly about this at all it is purely the shooters fault. for me the situation is very important in the applications of 3 and 4. The more there is at stake the more acceptable calling those rules is. Comments and opinions are most welcome. For players who have not won a major title, winning a World Championship is supposed to do a lot for them. It essentially puts them on the map. After winning a World title ideally you are now a household name throughout the pool world, making it easier to obtain sponsors and not have to grind it out as much as many have to do now. The life of a professional pool player is not easy as everyone knows. The light at the end of the tunnel is that a World title can give you some breathing room. Unfortunately the media coverage has been next to nothing. In 2016 a brief article pictures and score updates is not enough. Where are the video interviews of players? Where is the proper stream with commentary? Why is there no mention of a television deal in the works. If you cannot promote our greatest players on the biggest stage then what are we doing here? How can you except to grow and promote the sport if 90% of the world has no idea whats going on at the moment. Do fans of other sports have to seek out random Facebook pages for updates of their most prestigious events... I think not. Again I will ask what does the WPA do to ensure the continued growth and success of the sport. What do they do for juniors throughout the world? Is there referee programs? These are all just basic questions, they might be doing all this but for certain they are not getting their point across. The most action I have ever seen from the WPA is when they attacked Charlie Williams for calling his 14.1 Event a World Championship without their sanctioning. This year event started off with the announcement that they wont be streaming every table like they have been. The company involved could not guarantee their product because the infrastructure was not adequate, something the host country and WPA were made aware of last year. All this and I haven't even mentioned the less then remarkable payouts. There really needs to be more thought into promotion, otherwise the players we respect so much will all continue to struggle. My feeling is that the winner of this years event is getting robbed, because the promotional platform provided by the WPA and host are grossly inadequate. Does it matter if you won if nobody knows? Before you can fix a problem, you first have to admit what the problem is. 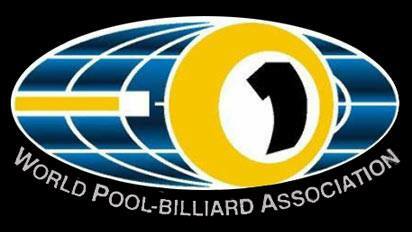 With professional pool that’s very difficult, primarily because professional pool in the United States almost does not exist. 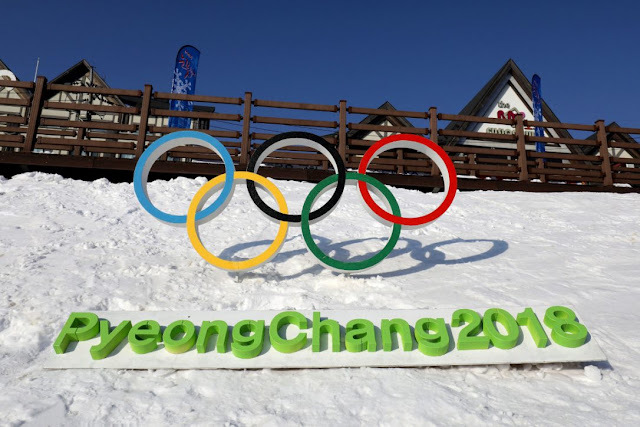 Almost all professional sports both in the U.S. and around the world have organizations designed to define and organize their respective sports and business plans. This usually starts with something as simple as a group or organization within the sport forming behind a straight forward mission statement. We could discuss what a mission statement is and what it should say. But that would be premature because professional pool does not yet have such an organization, and whether the goal of the organization should come first is a chicken or egg kind of question. Before starting to discuss a possible organization or what their mission should be, I would like to suggest that we define some basic terms and concepts.For the purposes of discussion, I am defining professional pool as a sport where experts compete for prize money that is greater than the entry fees. This is an important concept, because many pool tournaments and events pay the athletes primarily from entry fees. If the entry fees for a particular event are merely divided among the participants based on finishing order and no more money, or very little, was added to the prize pool, that is not a professional sport. If a group of one hundred competitors pays $100 each for entry, and the prize pool is $10,000, the athletes as a group broke even. That is not a professional event, and the athletes as a group did not earn any money. They just redistributed it. To be honest, adding five or ten thousand dollars to an event and adding that to the same $1000 in entry fees, hardly qualifies either. A $10,000 added tournament that takes one hundred entrants, the average athlete makes $100 for competing. Even if the player finishes in the top fifty, he probably won’t make enough to cover travel expenses. That is not a profession. It’s a hobby.To be called a professional sport, athletes must compete in a venue where seats are sold and money is generated aside from athlete entry fees, by the promoter who pays the athletes out of revenues earned from ticket sales and advertising revenue. If broadcast revenues can be added, so much the better, everyone makes more money. There is a real problem with the current perception of who should be paid, how much they should be paid, why they are paid, and where the money should come from. Most of the misconceptions come from lack of understanding of why professional athletes are paid in the first place. It’s common among athletes to assume that because they work hard at their craft, and have attained a certain level of proficiency at it, they should be compensated, but working hard and being good at something doesn’t make money fall out of the sky. The money has to come from somewhere. Where does a professional athlete relatively large income come from? It comes from the fans who pay for seats in arena’s where sports are played and if enough people are interested to have the sport broadcast, and advertising revenue is generated, the purses and salaries go up. Why? If a promoter can sell enough seats and advertising space to earn a profit, he is willing to pay the athletes for providing the show. Otherwise he has no incentive to pay big purses and in fact may not be motivated enough to keep holding “professional” events. I’ll let you in on a little secret. The first pool promoter that figures out how to sell a pool show to the general public is going to make a lot of pool players very wealthy, and become very wealthy in the process.The current problem for professional pool is not the players, or a lack of talent, or gambling, or an uninteresting game, and for sure, the amateur organizations are not killing the game. They are growing a turnkey audience of already interested fans. The problem is that no one has defined a goal. The goal should be to increase purses. Big purses draw more interest from players and fans alike. The current model for a professional pool tournament is for a promoter to find a viable venue, sell the players on the venue and the pitiful purse. Then collect as much as he can from entry fees, a few pool related sponsors who might sell a few products, and maybe make a small deal with a hotel or resort that will make him a couple of bucks, then divide up as little as he can to provide a purse and keep what’s left over. The players will complain that the purses were too small, and the promoter will complain that he worked his tail off and made little or no profit.That isn’t a professional sport. It’s an amateur gathering of pool people expecting more than is reasonable off a very small pie. The current state of professional pool is this. It’s a very interesting game, played by millions of people and it takes place on a surface that plays well on screen, has a large number of extremely talented and interesting and very expert players, who almost no one knows exist. They playing very competitive matches for each other and a very small number of fans to watch, and no one is even attempting to sell the game to a larger audience. They are swapping the same small purses back and forth among the top players, while never even speaking of the game to non-players. Additionally, the professional players and promoters are making a myriad of excuses for the demise of a game that has never really been promoted as a legitimate professional sport. As a result of all of these excuses being put forth, we have damaged the public perception of the game, making it harder for promoters to sell the game to a new audience. If pool is to make strides towards respectability, it is important to define the goals. I would suggest that since tours promoted by a single promotion company have been tried several times in the past and failed, that an organization of several promoters be formed to encourage cooperation in putting on a tour involving individual promoters for each event. Through cooperation, they could form a rules committee, possibly involving some of the players, so that there is some consistency in the rules of events. They could also share the advertising, as amortizing advertising costs would allow them to spread the large cost of promoting the events out and reach more potential fans. Cooperating could also lead to a points system similar to golf or tennis and possibly even a qualifying program. The possibilities are endless. 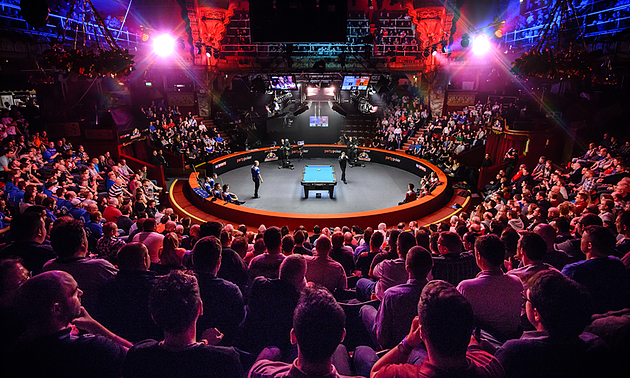 Ultimately, the game needs the support and a fan base to be developed not just among pool players, but among the general public. It is a very interesting game, with character, and characters, drama, it is highly competitive, and it plays at a very watchable pace I would also suggest that a number of the events take place in existing full time pool halls, as it is often suggested that the very places we all play are in need of additional sources of revenue and it eliminates the cost of moving and installing the tables. Pool will not be saved by some miraculous outside source or happenstance. The Hustler or The Color of Money will have no third installment, and no other movie production about pool is on the horizon. Manny Pacquiao is going to go from boxing to statesman, and Kevin Trudeau has his own problems and won’t be reinventing pool promotion again anytime soon.Ultimately, pool is a goldmine of opportunity. It will take a huge effort from more than one to make it succeed. AC Henry runs http://www.caliberbilliards.com/, he makes his own tips which he sells on this site as well as writes article such as this, make sure to check out his site! Corner Bank 10 Ball Series: Postponed or Cancelled? Just over a week ago pool players and fans had to absorb another bitter disappointment as the highly anticipated Corner Bank 10 Ball series has been postponed. This announcement was just days after a press release came out finalizing details such as dates and payouts. It was released that there would be five qualifying tournaments with $25,000 added in each event and one grand finale with $100,000 added. Of course this caused a big stir to professional pool players and fans alike as there is simply nothing comparable out there today. The Corner Bank 10 Ball series was immediately going to be one of the most prestigious circuits in the world guaranteeing $15,000 for first prize for their five qualifying events. With $100,000 added in the grand finale I would assume the projected first prize would have been somewhere between $30,000-$40,000 but those numbers never came out. For those that remember the original plan was to hold the first World 8 Ball Championships since 2012 at the Corner Bank. The World Pool Association does not raise the money or look for the venues themselves, they rely on a group of investors or an independently wealthy person like Manny Pacquiao to come up with the required amount of money to be allotted a World Championship sanctioning. So what has happened outside of 9 Ball, is that the World 10 and 8 Ball have had years of gaps in between events if no one wants to basically donate nearly $300,000. As we all know, last year Pacquiao hosted the first World 10 Ball Championship in the Philippines. He put up the money and the W.P.A took a percentage as "administrative" fees, and they got to call their tournament a World Championship. The Corner Bank apparently had a similar group of investors interested in doing the same thing except this was going to be for the 8 Ball. It was the biggest announcement for North American pool players in decades, as there has been no World Championship held on the continent since the 1990's. It was about a month after this announcement that the organizers stated they would be stepping aside to let China take over the World 8 Ball Championships as they had made a 5 year commitment with a prize pool of $300,000 for both the Men's and Women's divisions. It is still unclear whether the W.P.A gave the World 8 Ball to the Corner Bank and approved a press release or not. If they did then it is still unclear why they would be entertaining other offers after they have given the World Championship to another bidder. I stated in a previous article this would not happen in any other sport. I understand the investors behind the Corner Bank bid wanted to have an event they could build off of for years to come and a future bid against China would have been hard or impossible to match so we collectively sighed and allowed ourselves to understand.. That being said this was handled poorly at all levels and did nothing but get the hopes up for players and fans. There has still not been a date added to the W.P.A calendar for World 8 Ball Championship for 2016. A few months later once the 10 Ball circuit was announced it was easy to make the connection of what was going on. The organizers were planning to parlay the money from the defunct World Championship bid into this circuit, which is fine and provided a great deal of excitement. With still less than a decade of experience in this "pool world" I am not one of these jaded guys that scoffs at every big announcement. I was generally excited to hear the owners of the Corner Bank and the group of investors were still interested in doing something great for pool. That being said even at the original announcement once the numbers came out I had questions. For instance co-owner and television personality Jim Wych talked with Billiard Digest(BD) and spoke of "investors" not sponsors. There is a big difference, as an investor plans to build the product and eventually profit from it, which is something myself and Erik Hjorleifson here at Cue Sport Nation are big proponents of as we believe for the game to grow promoters need to make money. A sponsor is someone who simply wants to add money to the prize fund and have their company name branded all over the event and are not trying to profit directly from the event. From a media perspective there has been a lack of transparency in these proceedings. I cannot call up these investors and asked them what went wrong because they have not been identified. I cannot ask the owners of the Corner Bank because they apparently wish to not comment as I have tried to reach out. 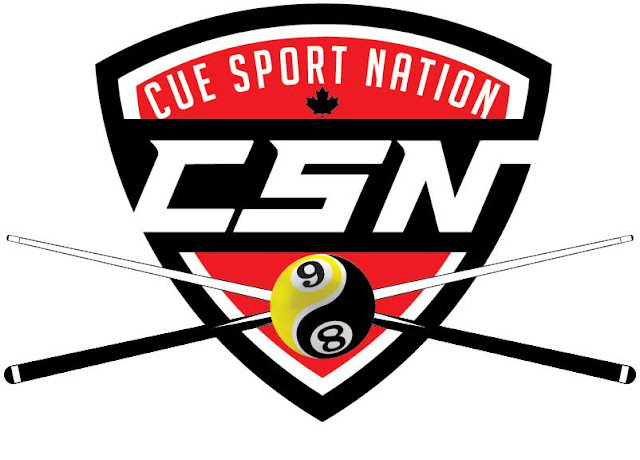 So far they have been picking and choosing who they speak with and the reality of the billiard media outside of Cue Sport Nation is no one else asks the tough questions. There is a thought that if you criticize a promotion that it is bad for the game overall but I would point out the NFL, Baseball, Hockey and all the major sports to those who think like that. All these sports have had major controversy and have not only bounced back but have done even better since. This stuff is just a part of doing business - but that topic is for another article. Combined with the Grand Finale there was going to be $225,000 in added money, a substantial investment. Let's imagine that Cue Sport Nation is the investor for this circuit. The entry fee for these events were slated to be $250, which means if they get a full field that is $32,000 in entry fees if it was a real successful circuit. And if each field maxed out including the final that would make $192,000 which is still in the red financially speaking. With these events being hosted in a pool room the age old problem of seating for spectators comes up. Logically the amount of paid spectators to each event would be limited making it hard to make money that way. Next would be stream revenue which I assume they calculated in this. We had one promotion called Bonus Ball whose business plan was strictly geared to revenue from stream purchases and we all saw how that worked out. If money could not be made on streams or spectators was there talks to have this tour air on a television network? Did the investors have a deal with the Corner Bank for a percentage of their sales during these events? These are all standard questions that would be asked by other sports journalists in other sports but are almost impossible to get a straight answer from pool promoters which I believe is inadvertently hurting the image of our sport as a whole. As an investor these would be big questions I would have and if they were not addressed properly I would pull out my money as well. From an outside perspective and of course because of transparency issues I lack all the details, but from the looks of it these investors would have to fork out $225,000 a year minimum to keep this circuit afloat. If they would have continued on with this circuit in my opinion it would have been nothing but a one off "make a wish foundation" wish for pool players, which does not help the sport or the investors long term . This has brought me to the conclusion that this circuit has been cancelled rather than postponed. Jim Wych and John White own what is known as one of the nicest pool halls in the country and are both well respected throughout the sport. They are both accomplished players and Wych is a well known T.V personality for Matchroom Sports events. I wish them all the best and whenever they make their next big announcement Cue Sport Nation will be there to freely promote it like we did the World 8 Ball and the 10 Ball announcements. I would imagine a valuable lesson in business has just been taught here about having all your ducks in order before making a splash like they did. At the end of the day there is a right and wrong way of doing things. Did P&B Make the Right Choice for Male Player of the Year? Ko Pin-Yi. Photo by Markus Noé. This past weekend Pool and Billiard Magazine released their first issue of 2016, and inadvertently caused a bit a stir. It was early Saturday afternoon as I was aimlessly scrolling through my Facebook news feed, when I saw the Pool & Billiard (P&B) online version of their magazine posted on Phil Capelle's wall. The main story of this issue was their picks for players of the year. On the women's side the pick was Ga Young Kim and the Men's was Shane VanBoening. Anytime there is a choice for an award such as this there can usually be arguments made for one player or another. For instance Siming Cheng could have easily been an argument for player of the year. She is ranked number 4 on the World Pool Association(W.P.A) players list but won many non ranking events in Asia, where we all know is stacked with female talent. However Ga Young Kim had a very successful season as well and overall I think no one had an issue with that pick. Now for Shane VanBoening who also had a great year by repeating as Champion at the World Pool Masters. He had a runner up finish at this years World 9 Ball Championship in Qatar, and won the Challenge of Champions. A very impressive year and he won various other titles. Now usually I find myself defending SVB against his overly harsh critics. However this time, I like many thought the indisputable male player of the year was Ko Pin-Yi. Some players were visibly bothered by the SVB pick instead of Ko Pin-Yi, the most vocal of which was Darren Appleton. He made the point that Ko won the two major events that are not only the most prestigious but the most sought after by the players, which is the World 9 Ball and World 10 Ball Championships. To win either one of these titles one has to make their way though a talent packed field of the best 128 players in the world. Make it even more difficult once these fields get down to the final 64, despite anyone's record the tournament switches to single elimination. Ko was able to accomplish this feat twice in a single calendar year, something that has never been accomplished before. It should be noted that Phil Capelle is the author of this article, but this apparently was a "board" decision by P&B. Obviously Capelle and the people at P&B are knowledgeable and the magazine itself and books by Capelle are a great resource. I just feel on this one they got it wrong. It is pretty clear who my pick is and other publications will have their pick as well so this was not the "end of the world" by any means. However like I mentioned before this past season there was such a clear cut player of the year, that it was shocking and reinforces something that I have been coming across frequently. Which is either a lack of appreciation or knowledge of Asian and European players on this side of the pond. When in reality outside a few top North American players, Asia and Europe dominate the international pool scene. Now I feel that last statement should not be controversial but it will be to some which further proves my point. This is an opinion piece so feel free to post your thoughts or share this article with your friends. Also Ko Pin-Yi will be at Turning Stone which starts today so this will be a great time for those who have never seen him play to do so. I will be there for the entire event and hope to see as many of you as possible.